Does your boss get nervous about paying overtime, yet you’re expected to monitor your servers 24/7? Problems don’t usually happen during business hours so working some nights and weekends to maintain the integrity of your database has become the norm. And summer will be over before you know it! You need some sun! Mobility is no longer a trend, it’s a reality for Today’s DBA. Striking work life balance is even harder than ever. Today’s DBA is often asked to manage many more database instances and even participate in analytics, DevOps and cloud initiatives. Of all the ways your mobile devices give you flexibility, have you ever used them to monitor your SQL Server performance? Think of the peace of mind that would give you as a DBA. 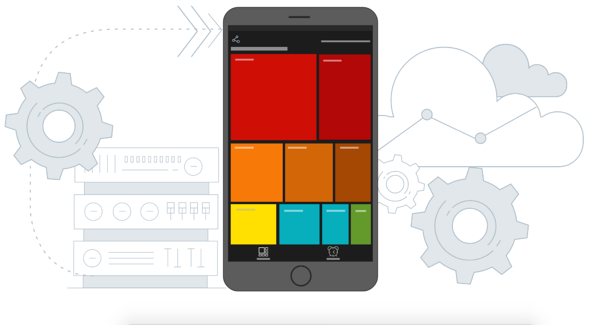 We call that “Mobility Tranquility” – the freedom to monitor the health of your SQL Servers anytime and from anywhere using the Spotlight Cloud mobile app. Why stop your life to monitor your SQL Server databases? It only makes sense to add your performance monitoring duties to the long list of things you can do from a mobile device, where convenience reigns supreme. We call this the “Dilbert manager screen” because you don’t need to know anything about SQL Server to understand how it works. But I’ll tell you anyway. You could be camping in the mountains, taking a selfie at Disneyland or cheering on your favorite team at the stadium while checking the Spotlight Heatmap and phoning your fellow DBAs in Chicago to have them troubleshoot. Lower and to the right in the Heatmap are the SQL Servers that don’t need immediate attention. You can examine them as well, but the iPad mobile app makes it clear how to set your priorities. When you swipe right, you see details like color- and number-coded alarms against each connected SQL Server, with their associated severity: How cool is that? Information at your fingertips to make immediate and informed decisions. For 24x7 SQL Server monitoring and management capabilities plus mobile diagnostics and issue resolution to keep your SQL Server environment humming all summer long. Oh… and did you know that you can also accomplish all this while saving your company money? Purchased on a subscription basis, with no additional hardware, no software, no maintenance costs, grab your sunscreen and start your free trial of Spotlight Cloud. It’s the modern way to monitor your SQL Server and get a tan! 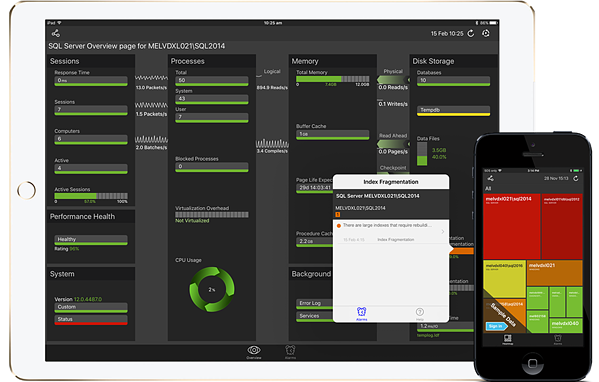 Get Spotlight Cloud now and start real time monitoring on your mobile device. Understand your SQL Server infrastructure health at a glance by monitoring SQL Server's relational engine, Analysis Services, Windows, VMware ESX and SQL Azure with Spotlight.